I hear that some people have been expressing more favorable opinions of some of Magic’s supposed modern low points, including not only Champions of Kamigawa but even Lorwyn, whose watercolor art and whimsical goblins make it a popular target for people who like to look edgy. The fact of the matter is, two years in a Standard rotation is not really enough time to form a complete, or often even a rounded, opinion of a set. 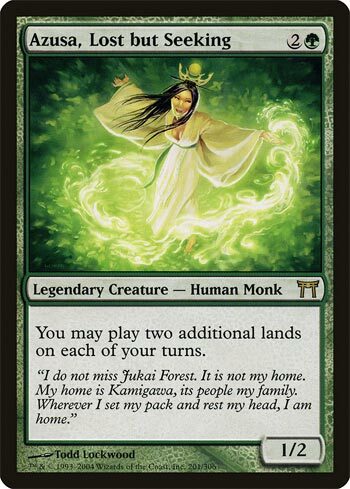 If you base your judgment of a set on Standard, you might miss a gem like Azusa, Lost but Seeking. Azusa is a great example of a card that does insane things when it works, and much less when it doesn’t. Stock your deck with the right support cards, like Rites of Flourishing and Treasure Hunt, and memorable stories are the result (often involving third-turn Eldrazi and Fireballs for 10,000). In a more cutthroat environment, it can be hard to guarantee things in the right order, and people are likely to be packing removal for things that look like combo cards, but the rest of the time, she opens the door to any number of impressive combinations. The only deck that doesn’t need more mana is Dredge – and depending on the build, that is not always a given, either. Most humans tend to remember bad experiences easier than good experiences. Kamigawa seems to avoid this phenomenon as many players look back on the diamonds in the rough. Umizawa’s Jitte and Sensei’s Divining Top are prime examples, but today we are looking at Azusa, Lost but Seeking. Green is good at ramping and that’s not going to change anytime soon. Play Azusa on turn 2 and your opponent is cruising for a bruising. Grab a Lotus Cobra, Primeval Titan, or Green Sun’s Zenith and go wild. The downside is that she is frail and, unlike Oracle of Mul Daya, you are limited to the cards in your hand. This gives her a “one and done” feel unless you play Cultivate. Although she might not be a good Commander herself, she is easily splashable in most decks. A trend I noticed with Kamigawa block is that the good cards are extremely good and the bad cards are extremely bad. Azusa, Lost but Seeking is one of the good cards, even if she doesn’t look the part at first. A 3-mana 1/2 is nothing special, but a permanent Summer Bloom on a body is very powerful, and her price tag skyrocketed with the popularity of the “Amulet Bloom” deck that briefly tore up Modern and got Summer Bloom put on the ban list. She’s fairer all the same as a more expensive and Shockable body…that can still start shenanigans on Turn 2. Without Summer Bloom, the deck is weakened, but Azusa still has a place in decks like Titanshift as an alternate avenue for getting their win condition online.